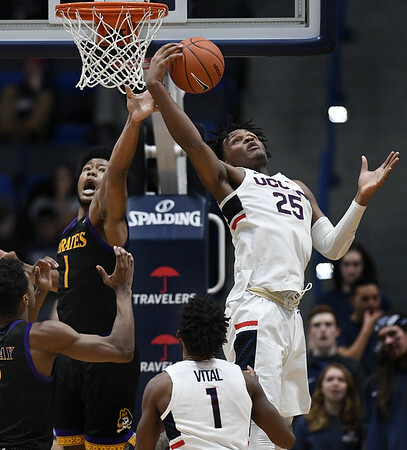 HARTFORD - UConn coach Dan Hurley benched senior star Jalen Adams early in the second half and the rest of his Huskies responded by routing East Carolina. “Anytime we can, we want Jalen on the floor, but having all the young guys out on the floor was very, very nice,” Carlton said. “You wouldn't think we'd get better with the best player benched in the second half, but that's what happened,” Hurley said. “We just had to rally around each other, play together, play as a team and that's what we did,” Polley said. Posted in New Britain Herald, UConn on Sunday, 3 February 2019 21:30. Updated: Sunday, 3 February 2019 21:32.